XPB Locker recently installed three bays of metal lockers in the Lighthouse for the Blind, located in San Antonio, Texas. The lockers were installed in the facility to provide workers with personal storage units. This installation was completed before the facility opened in anticipation of new initiatives undertaken by the Lighthouse for the Blind on behalf of visually impaired persons to whom the organization is dedicated to providing assistance. The Lighthouse for the Blind is a non-profit association that provides a variety of rehabilitation services and employment opportunities for visually handicapped persons. Over fifty percent of this facility's 500 employees are visually impaired and work a variety of manufacturing jobs. Rehabilitation services include independent living, technology training, and training in a variety of vocational fields. The metal lockers were one component of an entirely new construction that also included a brand new cafeteria and new manufacturing facilities geared toward supporting the United States Armed Forces. The Lighthouse for the Blind choose extra wide, two tier lockers for a variety of reasons. They are highly durable, being constructed from 16 gauge steel. Standing six feet in height and measuring 15" wide, they are easily accessible. With an 18 inch depth, they provide the ideal volume for employees to store supplies, personal belongings, and extra clothing. Accessory options for this line of lockers include sloped tops, optional built in combination locks, and name plates. Each locker has three wall hooks and one ceiling hook, and multiple shelves. XPB Locker installed a total of three locker bays within the facility. Management decided against built-in combination locks, preferring instead to have employees use their own personal combination locks. Manual, personal locks are easier for visually impaired persons to use. There is a 4,500 square foot work area within the facility where the majority of the manufacturing jobs are located. Many of the jobs in this work area are related to aerospace technology and technology training. The workers needed lockers to store tools, extra sets of clothes, and personal belongings. 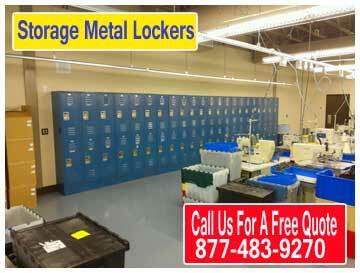 We installed three rows of metal lockers along the walls of this work area. Two rows were located on either side of the front entrance. The third row was located along the back wall of the manufacturing area. 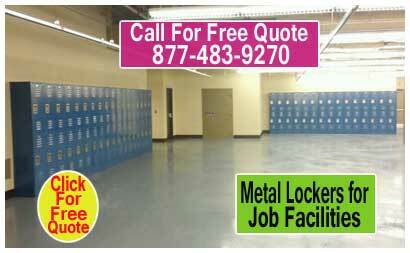 Metal lockers were installed with front bases and finishing end panels. Finishing end panels serve an important aesthetic function by covering up the ventilation holes on the sides of the lockers. The installation went without incident because the new floor was quite level and there was plenty of studs in the wall to which we could anchor the lockers. After ensuring that all of the doors swung freely without sticking, the project was complete. As this was part of a new construction, it was priority that metal lockers be installed quickly, seamlessly, and without impediment to other aspects of construction. XPB Locker was selected as the vendor because we were the only organization that SALB could locate that provides turnkey installations. This article was published on Thursday 19 June, 2014.